– Property owners are responsible for installing, repairing and maintaining sidewalks adjoining their properties. 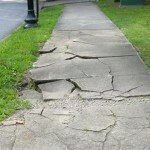 DOT staff will inspect sidewalks and notify the property owner of needed repairs. - In the event timely repairs are not made by the property owner, the City may hire private construction firms to make the repairs and then bill the property owner for the costs of the repairs. - Property owners must also keep their sidewalks and 18 inches into the street clean of all garbage, debris, weeds, etc. - Property owners are responsible for snow removal on sidewalks and public walkways. The DOT has put together a guide for property owners and New York City residents with answers to some of the most Frequently Asked Questions regarding Sidewalk Maintenance and Repair along with several informational videos and instructions on how to file expedited repair requests and how to select a DOT-approved contractor. CLICK HERE to visit the DOT Sidewalk Program website.